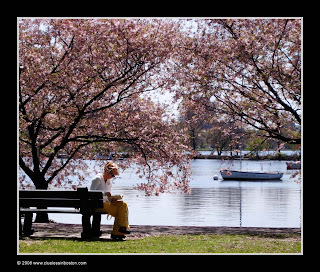 Quiet time on a sunny afternoon at the Charles River Esplanade. I could sit there and read all day! What a peaceful setting! What a peaceful, beautiful photo!!! Very peacful place to sit and watch the world go by. Smashing image. I took almost the same 2 days ago but yous is much nicer,the boat I have in the background is a motor boat and I found the picture lost its serenity because of that.. I enjoy the calm in yours. What a beautiful shot. Love the peace of it and such a beautiful setting. Oh lovely - and would you look at that blossom? I think spring's on the way! That looks like a perfec spring day! Almost thought you'd been visiting along the Potomac for a minute -:) Don't you just love the cherry trees in spring? A series of splendid photo. Love this! And the one below too! Were you down on the grass? TC!